Basically all you need to do is place a pair of trousers that already fit or a pair of trousers that are too small (like my son’s), onto the paper. 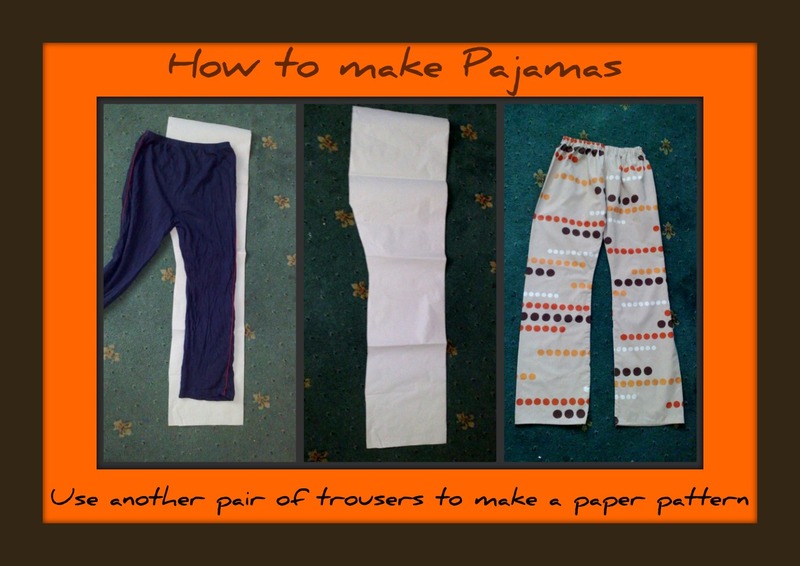 Fold the trousers in half so that you only see one leg. Then draw around the whole piece of the leg. If you require trousers to be the same size, then just add enough extra around your drawn pattern so that you have room for a hem and an elastic waist casing. The general consensus is about an extra half inch for the hems and an extra one and a half for the waist. If you need the trousers to be larger, then measure the waist and leg length of the person who will be wearing these trousers. Once you know what length of leg you need, just make sure that your pattern matches that amount not forgetting to add extra for the hem and waist. Once I had a one leg pattern on a piece of paper, then I can start cutting out the fabric. Place the pattern onto your fabric and cut out two shapes, then flip the pattern over and cut out two more pieces. You now have four pieces of cut out fabric. Then using the steps from either the tutorial I gave you , or find another tutorial, there are plenty out there on the internet, start sewing the pieces together. Basically just follow the way that your original trousers are sewn together. Once the pieces are sewn together you can then start making the waist casing. Leave a space so that you can insert the elastic, I use a safety pin to thread the elastic into the space. Then sew the trouser hems at the bottom. Voila, there you have a new pair of pajamas. I have actually made a pair for myself (following similar instructions) a while back. This is because I can never find pajama pants long enough for myself, because I have long legs. Whenever I shop for clothes, I have to buy long length trousers when there is the option, but it is extremely rare to find pajama pants in a choice of long length! My son loves his new pants, at first he wasn’t sure about them but once he had them on, he doesn’t want to take them off – he thinks they are so comfy! This overall project only took me about an hour! No complicated buttons or extras, just simple straight forward sewing. It is easier than you think, so why not give it a try. Good Luck.